Take I-5 South, to Hwy 91 East/Riverside. Continue pass Hwy 71, Exit at Auto Center Dr/Serfas Club Dr. Make a left at the exit. Make a first right turn on Wardlow Road. We are the building next to IHOP Restaurant. Take Hwy22 East or I-5 North to Hwy 22 East, then Hwy 55 North, to Hwy 91 East/Riverside. Continue pass Hwy 71, Exit at Auto Center Dr/Serfas Club Dr. Make a left at the exit. Make a first right turn on Wardlow Road. We are the building next to IHOP Restaurant. Take I-57 South to Hwy 91 East/Riverside. Continue pass Hwy 71, Exit at Auto Center Dr/Serfas Club Dr. Make a left at the exit. Make a first right turn on Wardlow Road. We are the building next to IHOP Restaurant. Take I-15 South to Hwy 91 West/Los Angeles/Beach City. Continue before you pass Hwy 71, Exit at Auto Center Dr/Serfas Club Dr. Make a right at the exit. Make a first right turn on Wardlow Road. We are the shopping center next to IHOP Restaurant. most observed holiday. Please call our store to check for holiday hours. Take Hwy 91 West/Los Angeles/Beach City. 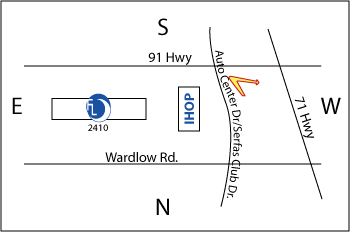 Continue before you pass Hwy 71, Exit at Auto Center Dr/Serfas Club Dr. (Exit #47)Make a right at the exit. Make a first right turn on Wardlow Road. We are the shopping center next to IHOP Restaurant.